Soap and Glory have been in my beauty routine for years, I’ve used the brands makeup, skincare and body care previously so I was super happy to be accepted as one of the brands #BabesOfGlory members. I was even sent a pin badge to make it official, its like a little group of S&G fans; what an awesome way to run PR campaigns. Recently I received a fab box of goodies to tell you all about and try myself at home. These particular products was all skincare and about looking after your skin. Like I’ve said above I’ve used S&G skin care in the past so I was already a fan of a couple of the items that I received. Inside the pretty pink branded box was; Soap & Clarity facial wash*, Peaches and Clean cleansing milk*, Glory Puffy Eye Attack* and The Ultimelt*, each product is a step in the skin care routine. It's now been a month since starting to use these products everyday to clean, cleanse and nourish. I already use the face wash but having the other items to use as well made my skin fully Soap & Glory loved! I regularly use the face wash and this came at a good time as my bottle was getting low and I really love the Cleansing milk which I have used in the past but wasn't currently using it until receiving this box. I remember trying both these products for the first time a while back and I was blown away by the results plus I love S&G packaging as it looks great in my bathroom, ha! For a daily detox, clean and fresh feeling I've been using S&G 3 in 1 daily face wash for some time now. I love the scent as it's so fresh and a great wake up call in the mornings especially with my super early starts now in my new job. The wash is easy to use, you only need a small amount, rub it between your hands then apply in circular motions onto your dampened face. The scrub particles are soft on my skin and don't leave any residue on my skin but really help to deep clean my skin. I do prefer to use this wash in the morning rather than night-time due to the fresh awaking scent but its all good to use at anytime of day. After using Soap & Clarity my skin feels clean and ready for the next step in my skin care routine. Peaches and Clean is the next step in my S&G skincare routine and its another gorgeous smelling product with scents of sweet peaches. This cleansing milk is lovely to use and not only because of the scent but its really smoothing on my skin and has a special clogged-pore formula which helps to keep my pores clean from dirt. I like to apply this onto a cotton pad then sweep across my face and neck, its surprising how much facial dirt can come off when using this product. The environment and day to day tasks can really stay on your skin so its important to cleanse and clean your skin to keep it looking and feeling great! A couple of pumps of the product goes all over my face and neck and I really love that its a pump action bottle as it helps the product go so much further, meaning more value for money! Puffy Eye Attack is a S&G product I've never used before until now and I have been out and bought some more already. With my new job having early starts, I've been suffering with puffy eyes and really needed a pick me up, these puffy eye patches have been a life saver!! 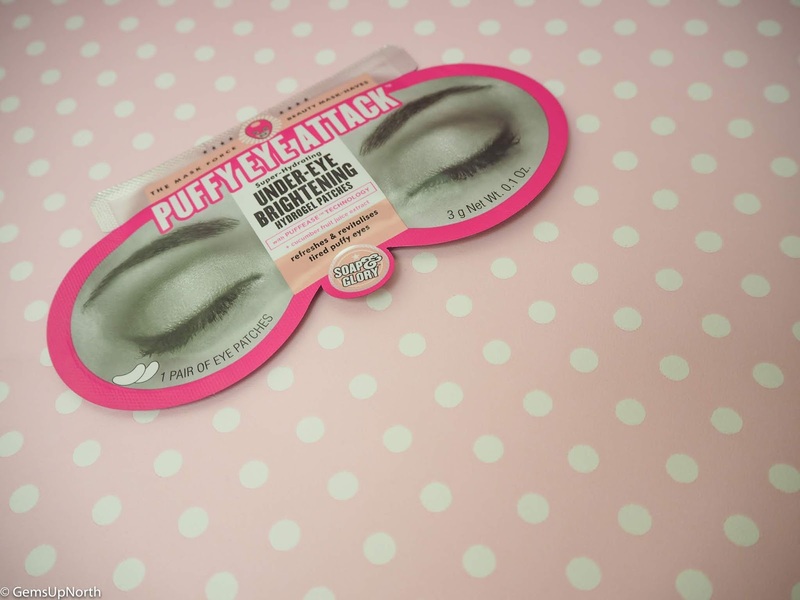 In each packet is two patches, one for under each eye, apply, lie back and relax for a minimum of 20 to 30 minutes but we won't tell anyone if you wanna relax for longer. The patches are cooling once on my skin and feel refreshing whilst being worn and after removed; they are super easy to use too! These are great if you have some time in the morning as I saw results after just 20minutes and was ready to start the day without my puffy eye look; if only it was acceptable to sit on the train commute to work with these on. Now this is a pamper night product in my eyes for when you've got some more time on your hands. The Ultimelt is another product I've never used before but I have become a big fan of the hot cloth cleanser. I've been using this once a week for a deep clean and detox for my skin, its been fun to make time for myself and have a pamper too. I thought this would be difficult to use or get used too but the instructions were easy to follow; apply a small amount of the cleanser to your face and massage it in for a few minutes, spend extra time on any clogged-pores, wet the cloth (which comes with the product) with warm water, ring out then remove the cleanser by pressing the hot cloth onto your skin. I instantly felt refreshed, relaxed and my skin looked brighter too, using once a week has been perfect for me but the product can be used more regularly if you wanted. If your looking for fun, great packaged products and excellent results then head to your nearest Boots to grab some Soap & Glory skin care or you can shop online at Boots.com. They sometimes have offers on too so keep your eyes pealed and don’t forget those Boots advantage points and vouchers too! *PR/Gifted products - all thoughts/opinions are my own, see my disclaimer for more information.